Caitt's Nails: LUSH CHRISTMAS HAUL. Hi guys! Today I wanted to show you a bunch of stuff I got from LUSH recently when all their Christmas stuff came out. I ordered online from Lush Australia for $9 flatrate shipping. I ordered on a friday and had it first thing tuesday morning. You can pay exra for express shipping, but in my experience it is not any faster. This is my first year trying xmas stuff from lush, they were all sold out of the stuff i wanted last year online. "Exquisitely fragranced with a blend of oils containing vanilla absolute and sweet wild orange, giving him a deep marzipan fragrance with notes of rich fruit, reminiscent of Christmas cake and figgy puddings." Read on After The Jump for the haul! Almond essential oil, sweet orange oil and cinnamon leaf oil give a smooth fruity scent with a touch of spice. It lifts the mind and lingers on the skin. We’ve also put popping candy in this mix, which gently crackles in the water, giving you a bath with sound effects. 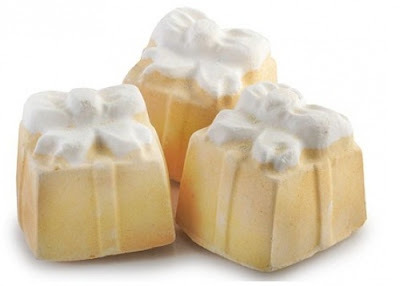 Run a deep warm bath, ease yourself in, then drop in this perfect parcel with a fresh burst of citrus. It has bright blue in the middle, but I spose this makes it easier to use for multiple baths as it is HUGE! This pink and green striped, candy scented mountain of a bubble bar is reminiscent of the traditional festive candy. Calming jasmine and ylang ylang scented bubbles. Perfect to help calm excited minds enough to get a good night's sleep. There’s also some Irish moss powder (a type of seaweed) in there to soften the skin and make the water silky. Spicy violet scented bath and a mound of twinkling bubbles. Once you’ve finished swishing, pop it on the side and use it again another time! LOVE THIS! An old favourite, but I do kinda like the shower gel of this soap better called It's Raining Men! His mythical sparkling purple and green plumage unfurling through your bath water. He’ll release gentle shea butter, cocoa butter and jojoba oil to leave your skin feather soft, and exotic essential oils of fruit and spices. Sparkly golden bar with citrus scents to bring you sunshine. Sunnyside’s orange, tangerine and lemon help to get us through the day, however badly it started. It’ll turn your life sunnyside up. Would anyone like a Hot Milk before bed? Hot Milk will delight you with the striking fragrance, which has been packed into this sweet, comforting hot (coconut) milk bubble bath. Have you tried any of these products? What do you think of them? I bet it all smells delicious! OMG HOT MILK IS BACK!? !